If you want a high-quality chain link fence at a great price, then call Orange Coast Fence Co. We're one of the premier chain link fence installers in Orange County. We specialize in commercial and industrial fencing, have thousands of satisfied clients, and have over 30 years of experience. By working with our team, you can rest assured that your chain link fence and gate will be custom designed and installed to meet your specific needs, constructed with professional-grade chain link fabric and hardware, and built according to the industry's highest standards. Every chain link fence and gate that we install at Orange Coast Fence Co. is designed to meet the specific needs of each client. We offer 9-gauge chain link which is ideal for most commercial applications, such as security fencing, warehouse subdividing interior walls, trash enclosures, and outdoor equipment/inventory security cages; and 11-gauge chain link, which is often used for residential yards, perimeter fencing, and dog runs. Our standard chain link fencing is made from galvanized steel that's extra durable, long lasting, and rust resistant. If a client wants a more aesthetically pleasing look, they can opt for vinyl coated chain link available in green, brown, beige, and black. For added privacy and security, we can also install privacy slats, which come in black, gray, green, white, rustic brown, sky blue, redwood, and beige to either blend in with or stand out from your fence's surroundings. In addition, each chain link fence can have barbed wire or razor wire added along the top rail or built with a swinging or sliding/rolling gate with fork latches, panic bar exit hardware, and/or a locking mechanism. Our owner himself performs each on-site estimate and applies his more than 40 years of experience to ensure that every job gets done right. He knows what factors need to be considered for a successful chain link fence installation, provides suggestions and solutions if a client has specific requirements or a budget to meet, and ensures that each fence complies with relevant city and county codes. Additionally, our practices for construction ensure a good looking, plumb and level fence. As a testament to our quality workmanship, we have an excellent reputation throughout Orange County and get the majority of our business from repeat customers and referrals. 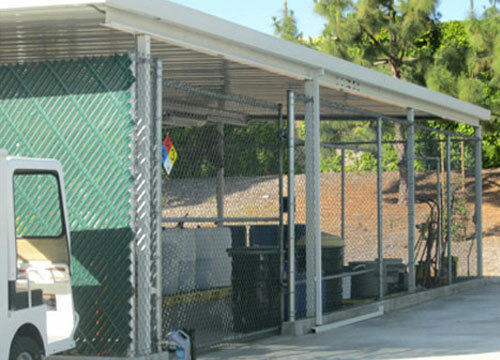 Orange Coast Fence also provides the best value in chain link fence repairs for Orange County home and business owners. Whether you have a section of fencing that was damaged during a storm or a sagging baseball backstop or trash enclosure, we can come out and make the necessary repairs at a cost-effective price. Our workmanship not only meets, but often exceeds, customer expectations and is backed by our standard warranty. 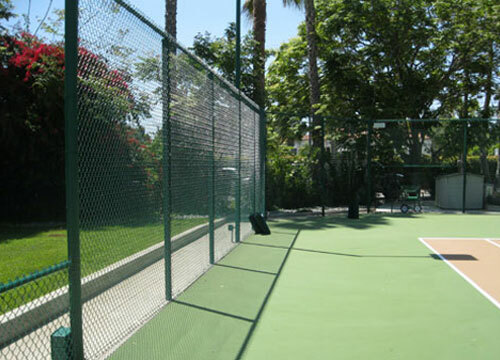 Whether you want chain link for a property fence, yard fence, pool fence backstop, or sports field fence, call Orange Coast Fence Co. of Santa Ana. We offer estimates over the phone, and free on-site consultations for chain link fence installations in Santa Ana, Huntington Beach, Costa Mesa, Irvine, Orange, Santa Fe Springs, Westminster, Buena Park, Anaheim, and surrounding areas. Regardless of the scope of the job, you can count on us to get the job done right the first time at a cost-effective price. 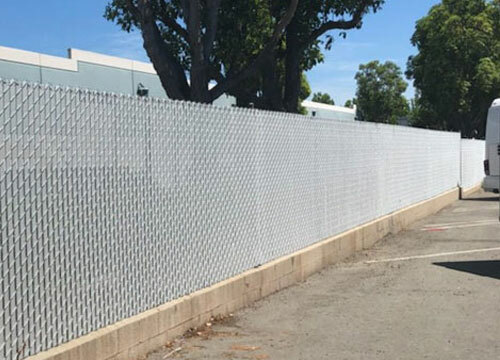 If you are looking to install or repair chain link fencing on your own, click here for more information on the chain link fencing supplies we sell at our facility.